According to quantum theory, the vacuum of space is a bubbling cauldron of “virtual particles” that spring into existence and then disappear when they recombine with their antiparticle twins. Stephen Hawking set about calculating how the intense gravitational field of a black hole might affect this process. 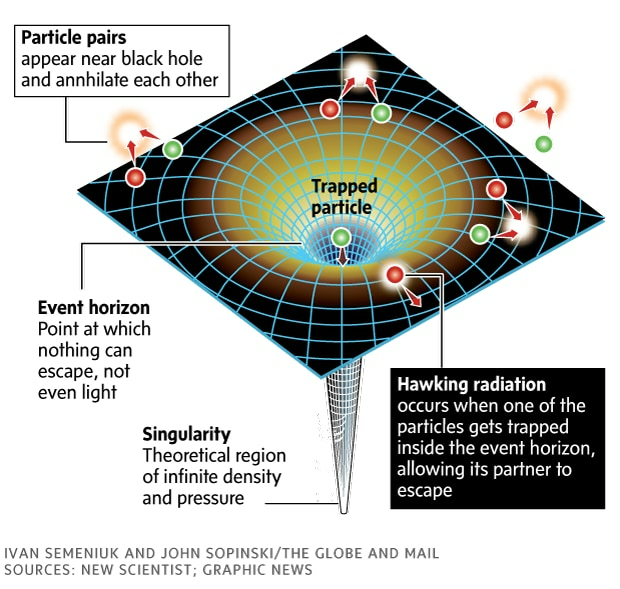 He found that when virtual-particle pairs are produced near the edge of the black hole − a point of no return called the event horizon − one of the particles can fall in, leaving the other one without a twin to annihilate with. The solo particle then flies away, effectively stealing energy from the black hole. Dubbed Hawking radiation, the effect means that black holes can slowly evaporate over time. If the universe expanded rapidly after the Big Bang, tiny fluctuations in the vacuum of space would be blown up to macroscopic size. Prof. Hawking was among the first to recognize this in the early 1980s and predict the effect. 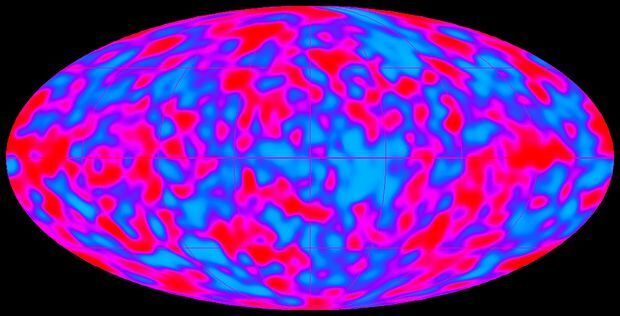 Evidence for the telltale fluctuations was first observed by NASA’s Cosmic Background Explorer satellite, launched in 1989. They appear as random splotches imprinted on a temperature map of the distant universe. The splotches show that when the universe was cooling after the Big Bang, the fluctuations had already seeded subtle variations in the distribution of matter that would ultimately trigger the formation of stars and galaxies. One of the biggest outstanding problems with current theories of the origin of the universe is how to deal with the fact that it apparently began with a singularity − a point of infinite density and zero size at the beginning of time. To dodge the mathematical problems that arise from this, Prof. Hawking and James Hartle conceived the no-boundary proposal, in which the singularity is eliminated by a mathematical manoeuvre akin to rounding off a sharp corner. To make it work, the theorists proposed that time as we experience it blends with space to become “imaginary time” near the beginning of the universe. The concept of time vanishes at the beginning just as the concept of south vanishes at the south pole. The proposal has been debated and challenged, most recently by Neil Turok and collaborators, but it remains a conceptual milestone on the way to a deep understanding of the origins of the universe.